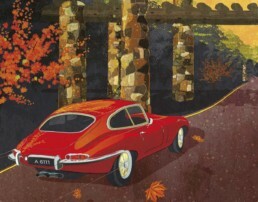 I think anyone with a soul remembers the first time they encountered the sweeping lines of a Jaguar E-type in real life. For me, I was driving along the river and saw a wild-silver-haired old lady in this long silver convertible parked on the bank, enjoying the calm summers afternoon. Both the lady and the car had seen better times, but I was struck enough to stop and ask her about it. She was quite mad, as in crazy, but this seemed to work in my favour as she offered me the chance to take it for a drive. I was still on P-plates and probably not the most cautious or skilled driver in the world, but this didn’t bother her and away we went, flying along the river with that long, long bonnet stretched out before us and a swathe of surprised onlookers in our wake. I’ll never forget the feeling. So, back to the present day and that lady is long gone. Perhaps the car is as well. A client asks me to illustrate a stretch of road on their premises for a presentation to the board. What car am I going to include? This is just a crop of a much larger illustration… but it is my favourite part. Here’s to you crazy Jaguar lady. I am forever in your debt.